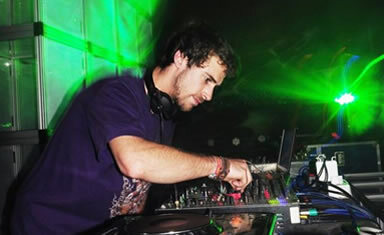 Chameleon is the solo act of psy-trance producer Alex Goodwill. He embarked on his voyage into the world of Psychedelic music back in the mid nineties, when he first went to London to explore the legendary Megatripolis party experience, a hugely influential part of the growing phenomenon which made up the early days of the London Goa Trance movement. Although producing psytrance throughout the norties it's since his major release ‘Onwards and Upwards’ on Nano records, written with Dj Pogo from the last Wingmakers compilation, that things have really taken off. More recently he's had a string of releases collaborating with the likes of Tron and Earthling. Also teaming up with Aphid Moon to produce the storming psychedelic anthem 'Synthetic Life' for Aphid Records. He is currently signed to london-based psy-trance label Liquid Records.